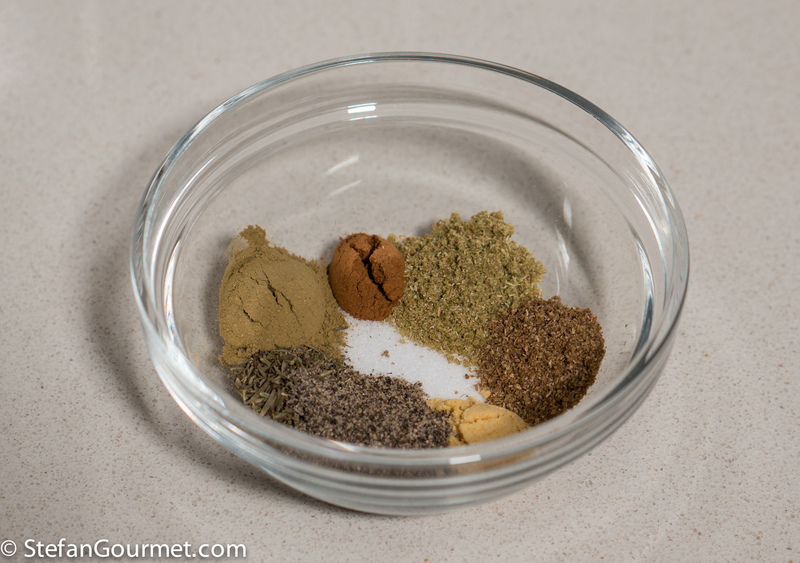 …and stir until the mixture looks homogeneous. 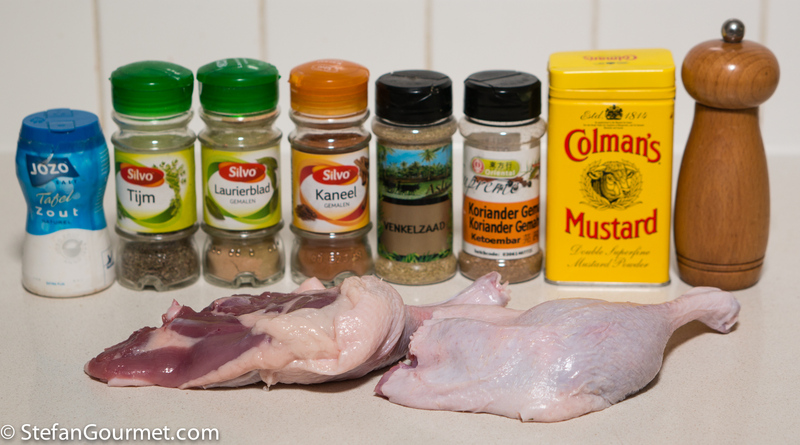 Rub the duck legs with this mixture on all sides, making sure to use all of the mixture. 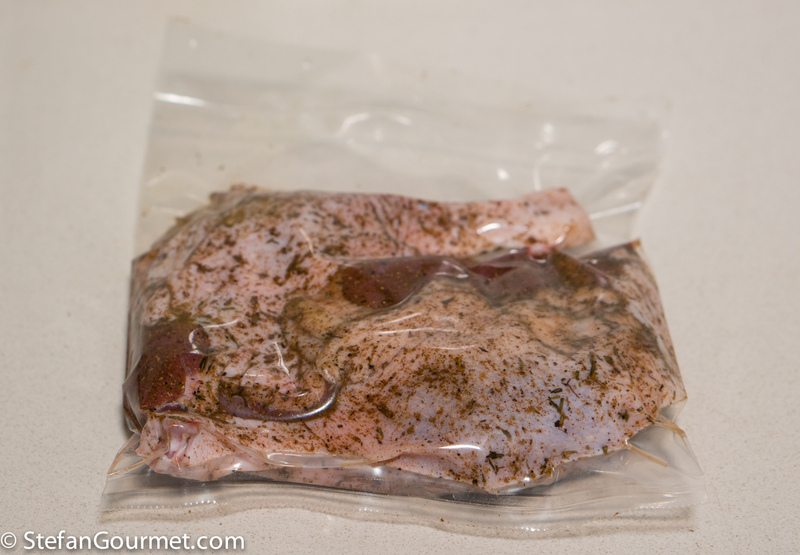 Vacuum seal the duck legs with the dry rub, and refrigerate for 48 hours. Classic duck confit recipes use a higher amount of salt and a shorter time. In such a recipe, you control the saltiness of the duck with the resting time. 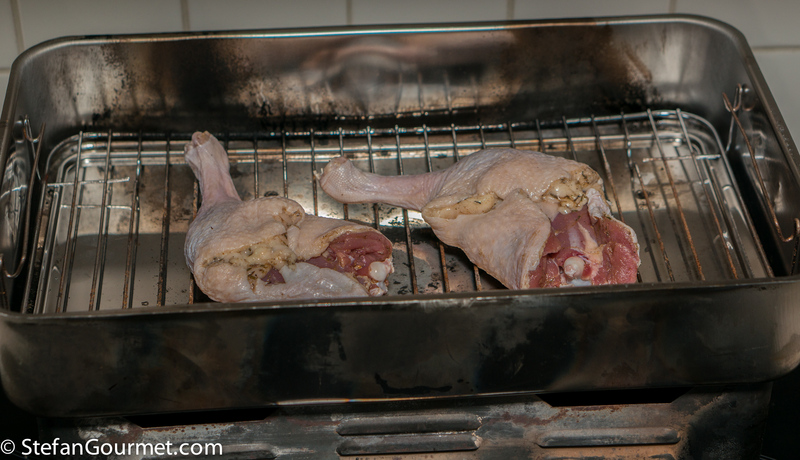 In this case, we actually wait until the salt has been distributed evenly throughout the duck meat. 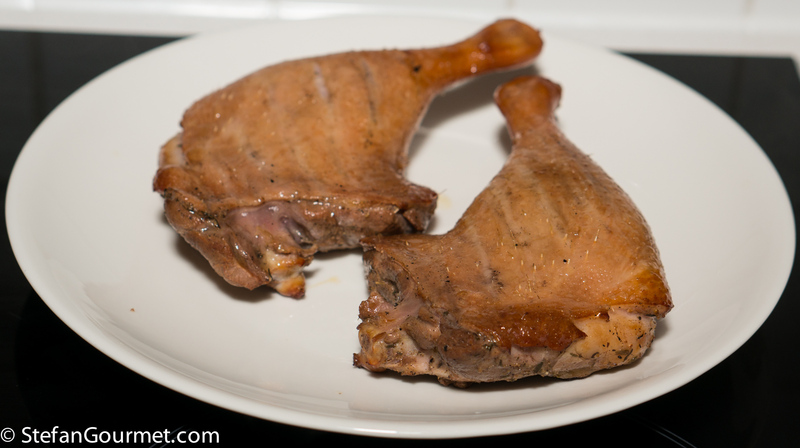 Because we use only 1 teaspoon (7.5 grams) of salt for 500 grams of duck legs (including the bones), and not all of the salt will be absorbed by the meat, the salt concentration inside the meat will remain below 2%. After those 48 hours, take the duck legs out of the bag and rinse them well under cold running water to remove any remaining salt and spices. 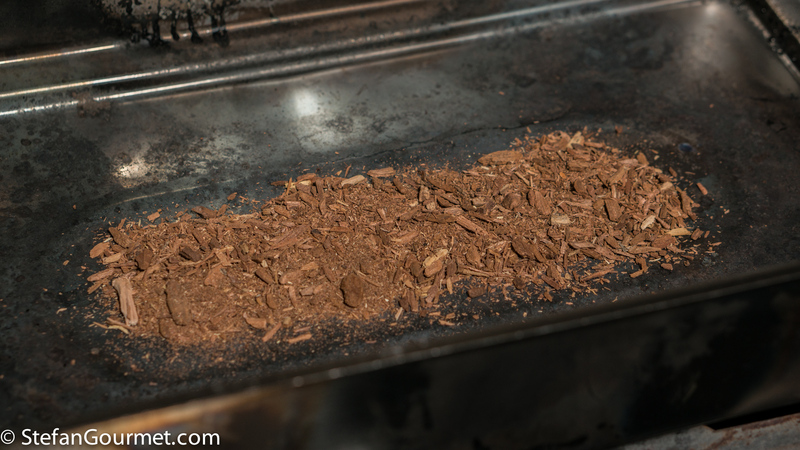 Set up a tabletop smoker with 2 Tbsp of smoking chips. I used mesquite, but other types of wood are fine, too. …close it, and smoke for 15 minutes. 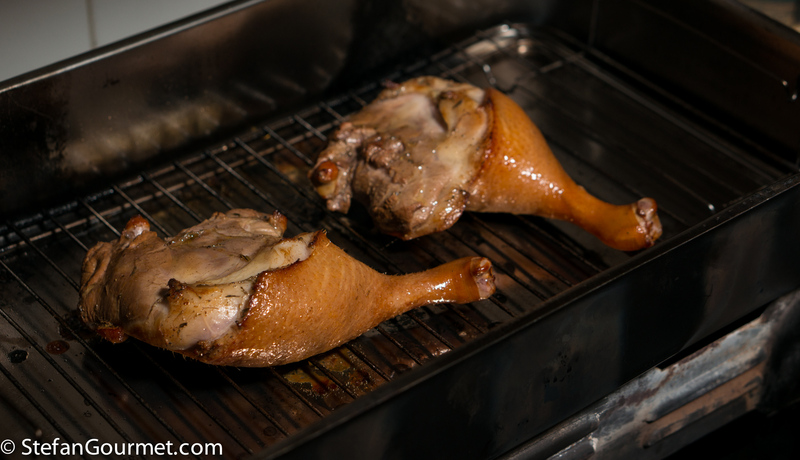 This is not enough to cook the duck legs, but it is enough to smoke the outside. Allow them to cool before vacuum sealing. …cook sous-vide for 8 hours at 82C/180F. Some smoke may leak into the water, that is nothing to worry about. 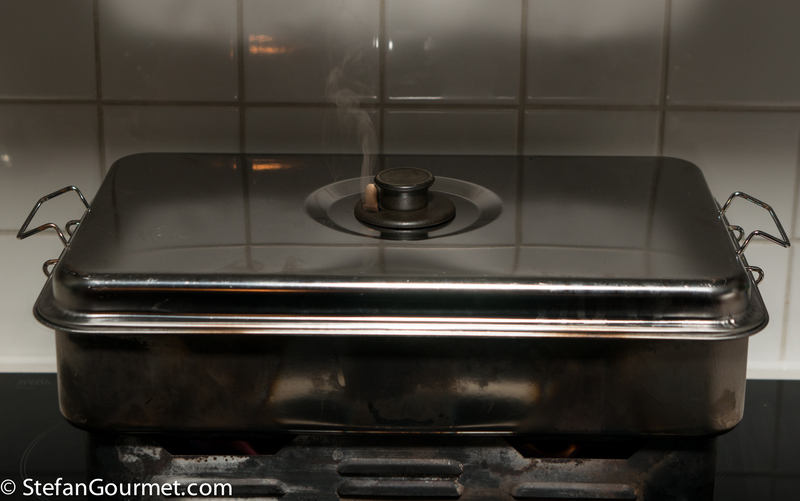 It is however a good reason to throw away the water instead of re-using it to cook something else. …and reduce them a bit if needed (taste them first!). 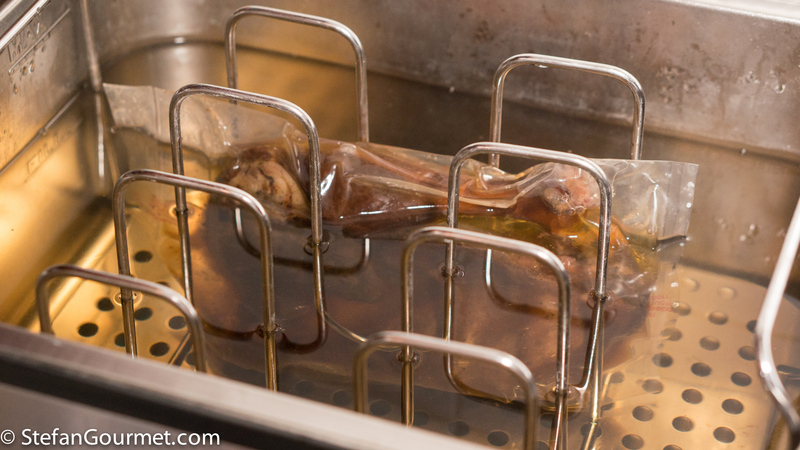 Because the duck legs were cooked at such a high temperature, the juices won’t coagulate. You could crisp up the skin a little with a blow torch before serving. 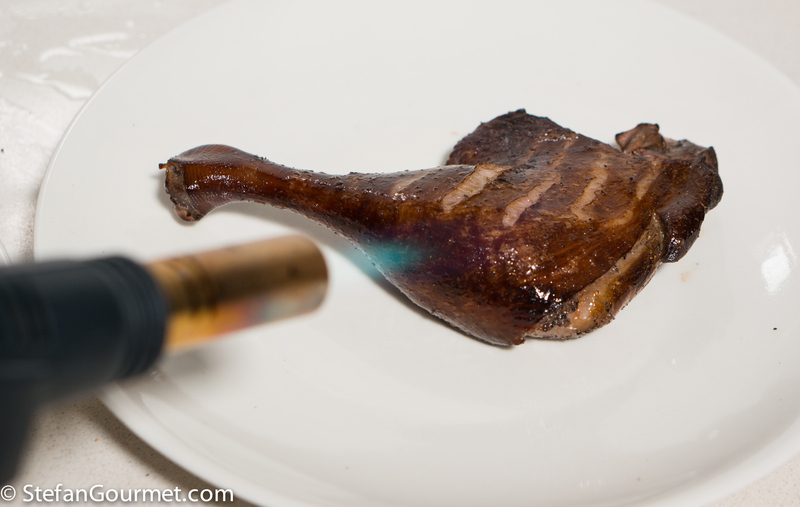 Because of the shape of duck legs, in this case a blow torch works better than a frying pan. 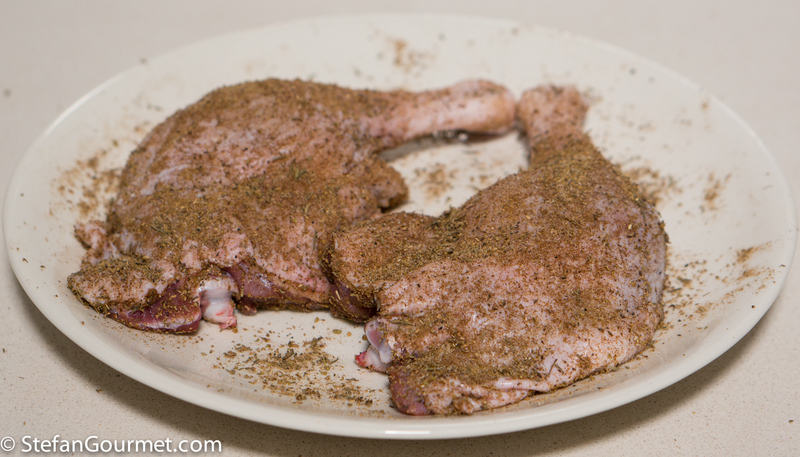 Serve the duck legs with the juices. This is great with a smoky pinot noir, such as a Spätburgunder from Germany. Many pasta dishes are great for a weeknight meal, as they take no longer to prepare than it takes to cook the pasta. 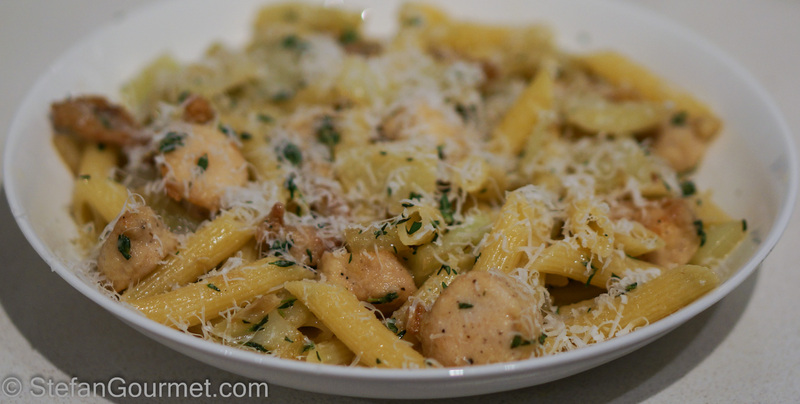 Pasta with Rabbit and Fennel is another example of such a dish, not a classic Italian recipe but something that came around from what I had in my refrigerator. The combination of fennel and rabbit worked out nicely. Rabbit loin is very tender and has a nice subtle flavor to it. I love meat smoked with mesquite! This looks quite tasty. Great idea, Stefan! 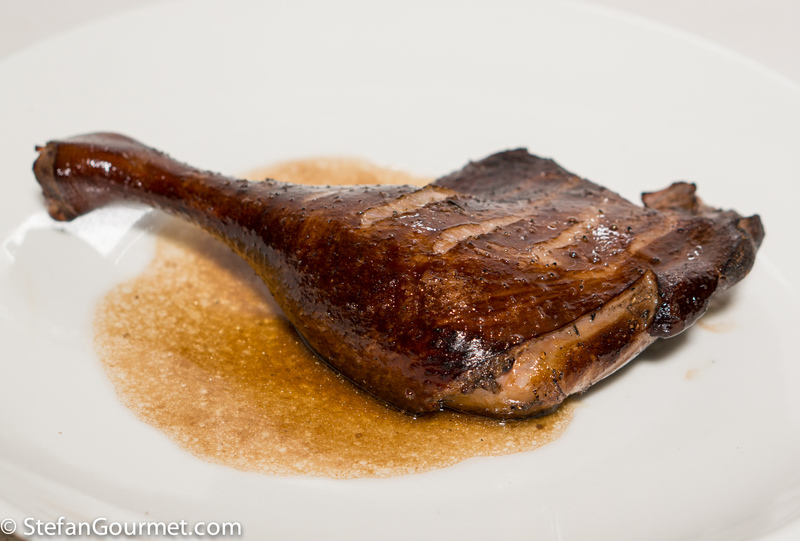 A nice twist to the “old school” confit de canard. I’m making it now (just vacuum sealed the legs with rub). Left the cinnamon out, because we often think it’s too predominant and we don’t like that. I also fresh bay leafs and thyme instead of dried. The only thing I weighed was the salt (just to be sure I used the right amount) and then I realised your spoons are a lot bigger than mine 🙂 So quantities in grams instead of spoons are better for me. I’m very curious how the duck legs taste after smoking and cooking. Thanks, look forward to what you think. By the way, it may be a good idea to invest in a set of standardized measuring spoons. 1 Tbsp, 1/2 Tbsp, 1 tsp, 1/2 tsp, 1/4 tsp, 1/8 tsp. The official size (everywhere but Australia) is that 1 Tbsp = 15 ml and 1 tsp = 5 ml. Just washed salt nd spices of the legs. It smells a little bit middle eastern. So maybe I’ll combine it with bulgur. But first I got to smoke them. 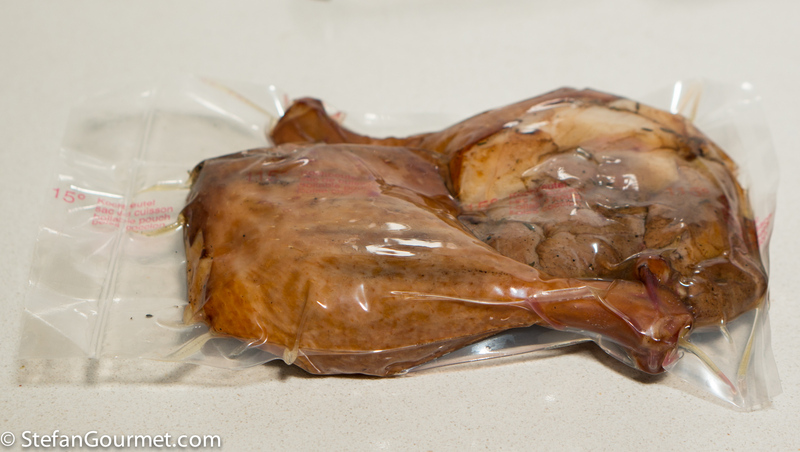 Q1: did you put any (duck) fat in the bag when cooking sous vide? PS I’m a litte bit too accurate, so I rather weigh than scoop. 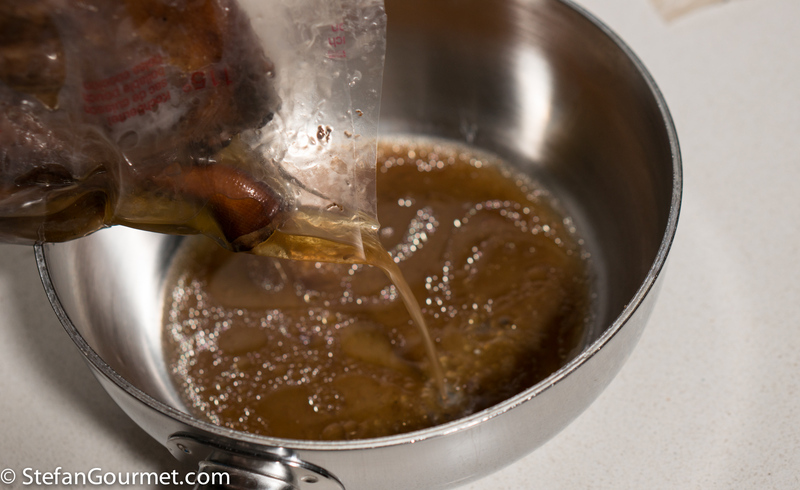 If you cook the duck legs at high temperature (80C) I do add a tablespoon of duck fat. 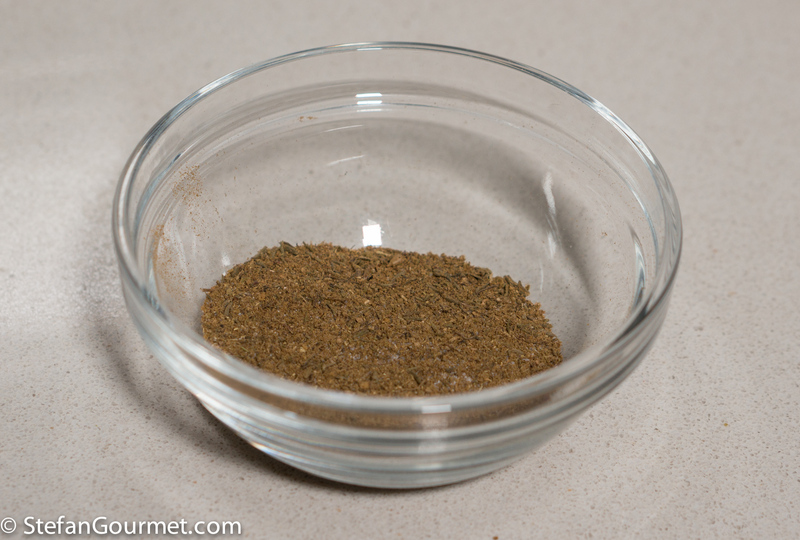 To weigh spices, you’ll need precision scales that show 0.05 grams. I think it’s too finicky. As a matter of fact I’m very finicky 😀 (great word, didn’t know it). Legs tasted great! Just added a little bit olive oil in the bag. After sous vide cooking there was enough fat to cook the legs in and when they were hot I just put them under the grill. Delicious, especially together with your fennel fondant (https://stefangourmet.com/2013/05/17/fennel-sous-vide-fondant/).